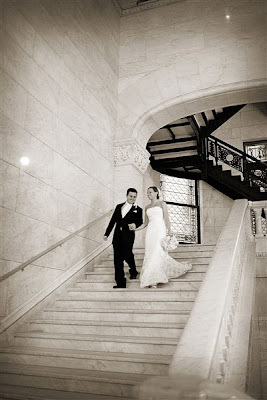 When looking for a wedding venue there were several things that I wanted to keep in mind. 1. Our wedding was going to be in the winter... in MINNESOTA aka snow, snow, snow so I knew that I didn't want to make our guest drive to both the ceremony and the reception venue. 2. I love old things, therefore I knew I wanted our wedding venue to have a antique feel to it. 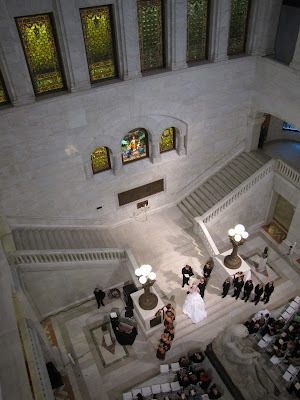 I originally desired to have our ceremony at an old church with huge stained glass windows but after thinking and realizing our guest may have to drive around in a possible blizzard, I vetoed out that idea. However I still wanted to encompass the stain glass windows or at least something old. 3. Chad and I love Minneapolis. It only makes sense for us to host one of the biggest days of our lives in a city that we have spent so much time in. 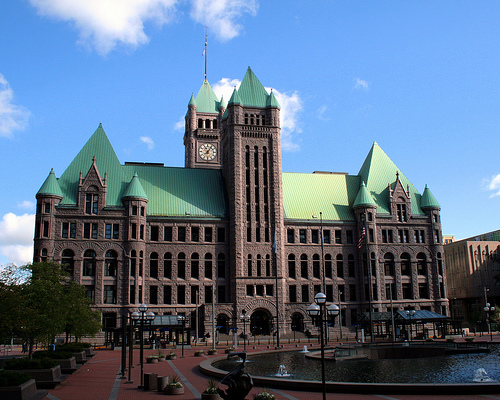 All of this leads up to our determined venue of the Minneapolis City Hall. 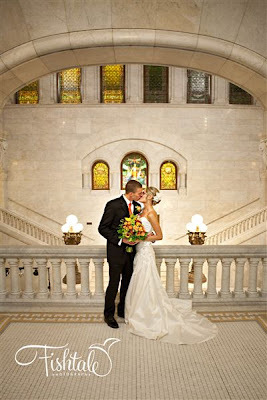 No it is not the typical county city hall where you can walk up to the judge and be married. It is a beautiful building with stained glass windows and marble walls. The building was established in the late 1800's and has SO much character. It is in the middle of the city, has underground parking for guest, and an awesome interior. there is a HUGE statue in the middle of the room. But I love everything else about this building so we decided to go for it! 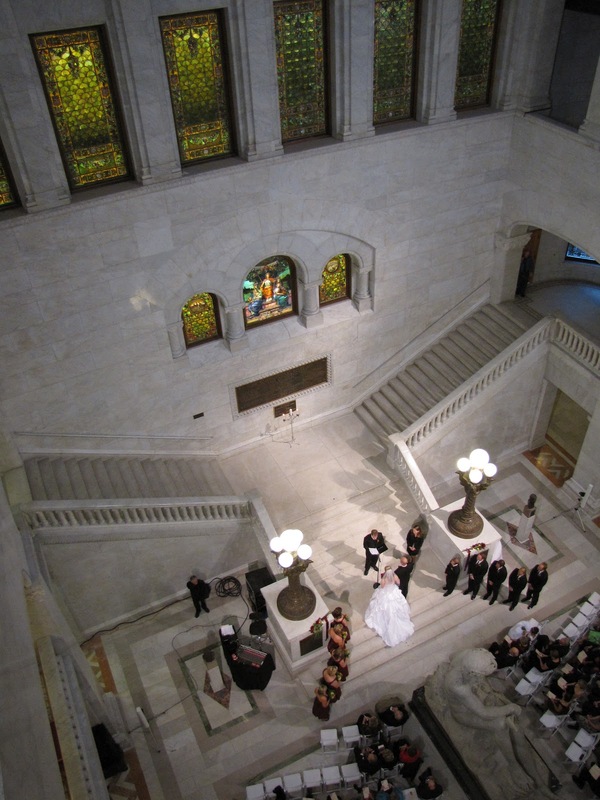 I am so excited having my wedding at the Minneapolis City Hall. If you are attending the wedding you can find out more information regarding parking and location here at the Minneapolis City Hall website. I actually got my bridesmaids dress coats from Old Navy to wear over their dresses. I found them on super deal (less than $30 a coat) around Thanksgiving. It made for some great photos and was a gift they could use over and over again! AH! Yay I love hearing other people's winter wedding stories. I am so excited for this and there are so many fun ideas! That is a great idea about going to Old Navy and getting the coats... I am going to look into it! So exciting! Enjoy the planning, it's so much fun!